When we built our home we tried to be as economical as possible. Growing up my childhood home had a HUGE playroom. My brother and I spent way more time in that room than we did in our own rooms. I want my children to play together. I want a lot of family bonding time in our home and less individual time. Zach and I also want our home to be a place that our kid’s friends want to come to. The “cooler” our house is the more likely that we will be the family hosting friends rather than our kids wanting to go hang out at someone else’s house. We didn’t have a large playroom when we built the house. We knew it’d be several years before we had enough kids where we would need a bigger play space. We built our house when Kye was 18 months old so we weren’t even pregnant with Britt yet! 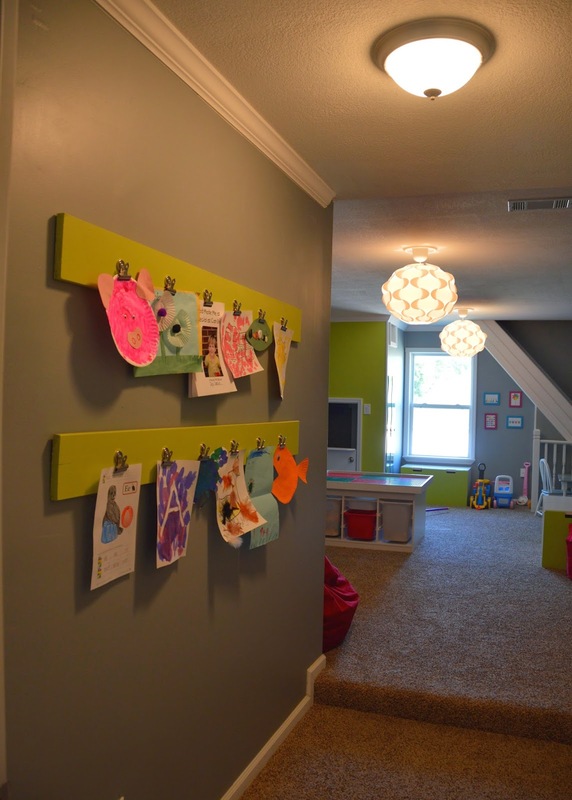 Once we started planning for baby 3 it was time to think about finishing the playroom. Kye’s new room is where the old playroom used to be so we needed the finalize space finished before he could move rooms! When they built our house we had the playroom on the house plans (you can see the plans here) but to save money we didn’t have them finish the playroom space. 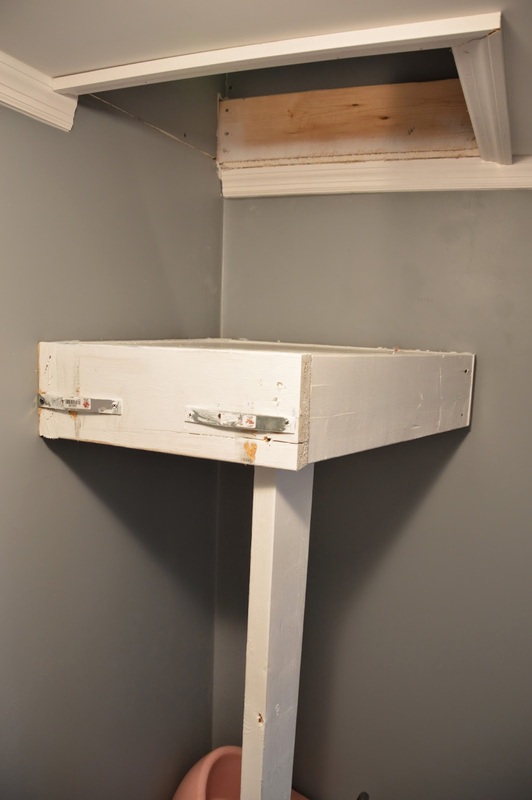 We left it as attic space to cut building costs, square footage, and electric costs. We did pay to have them put up the proper flooring in the room so it would be a legit room in our home and would have legit flooring (side note: they accidentally finished the flooring in the wrong room so our attic space now has the flooring and can easily also be finished into a 5th bedroom someday…maybe God’s way of saying we need five babies?!?!). Other than the flooring though, there was NOTHING! Zach was SO pumped about finishing the playroom. He did EVERYTHING other than lay the carpet and mud the walls. But Zach did the walls, insulation, ceilings, electric work, ac work, built stairs, etc etc etc. Every single thing you see in this room was done by him! I mean how AMAZINGLY talented is he?!?!?!?! 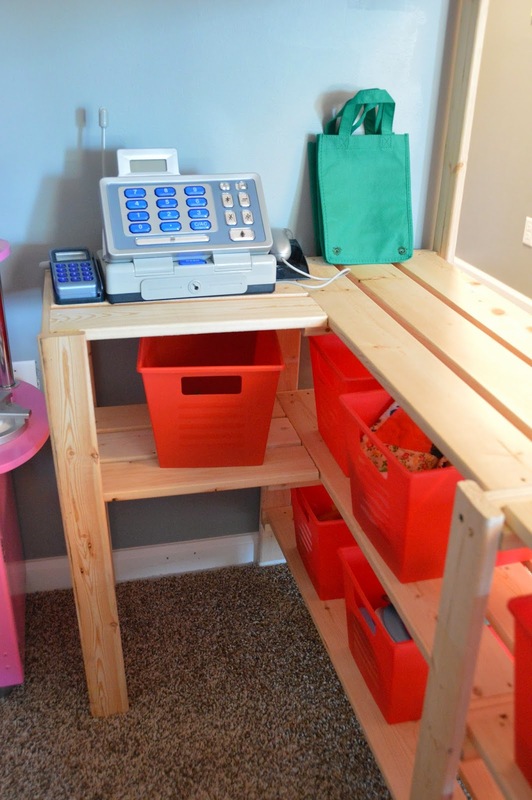 The only thing missing in completing the space is an area to store my craft (aka party planning) supplies. 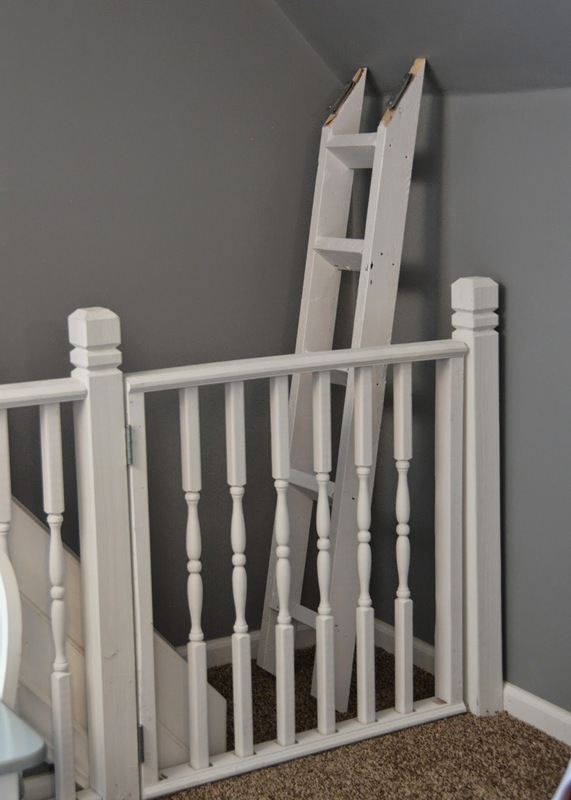 There are two small sections of attic off the playroom on each side (with small doors leading to them) so at some point he will finish one of those for my storage. We really wanted the room to be bright and fun and colorful. We decided to go with gray as the wall color and then have a lot of pops of color with furniture! You can see the old playroom here. When you first open the door there is a narrow hallway leading to the room. 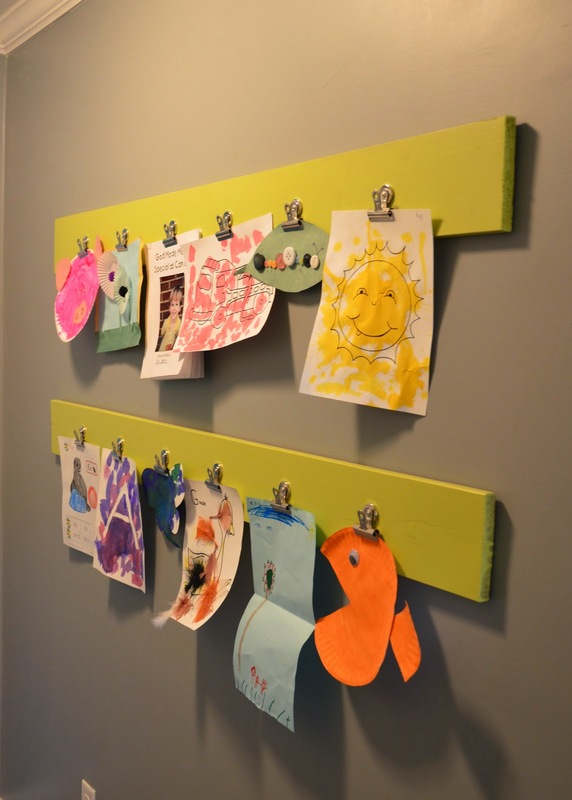 Zach repainted the wood boards from the art display wall in the old playroom and hung them along the hall. We decided not to put the decal on it because it would look too crowded. I hunted Pinterest a LOT when planning and designing this room. Of course Zach also had lots of opinions and ideas and I think we blended our thoughts together very well! We took a trip to Ikea and purchased the majority of the furniture items for the space! 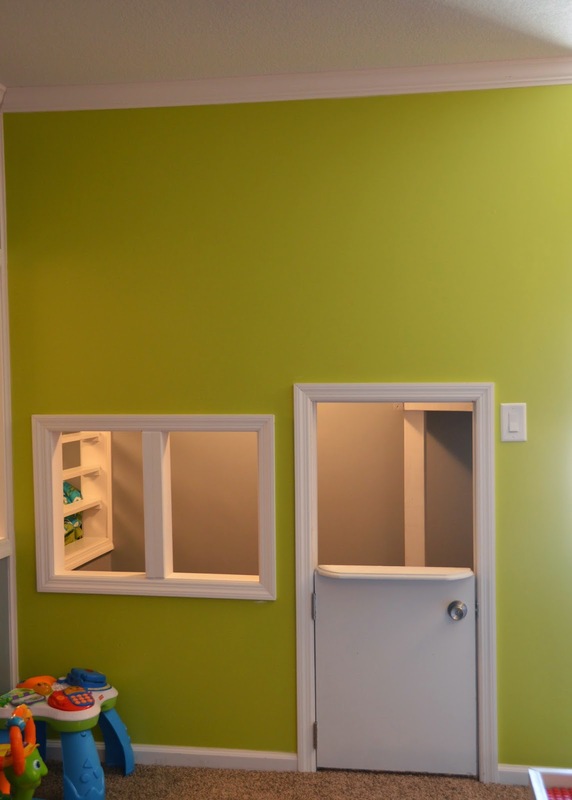 Zach built a playhouse within the playroom. 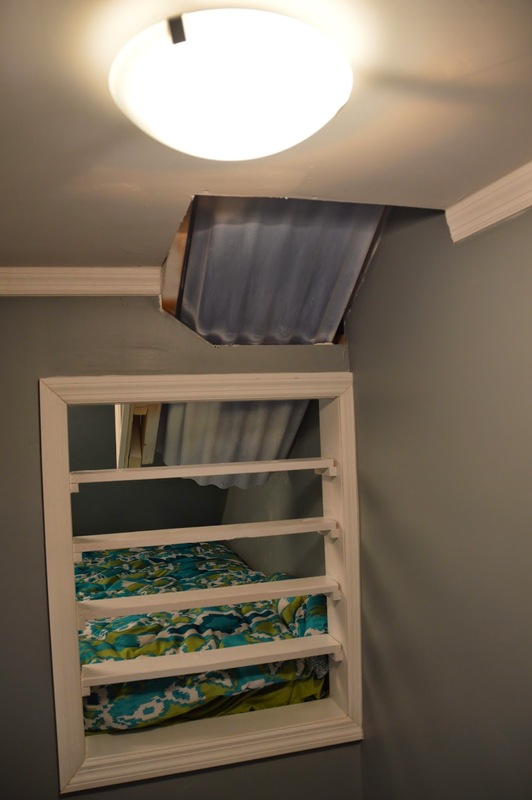 It’s two stories and includes a slide that goes down into a hidden bed! 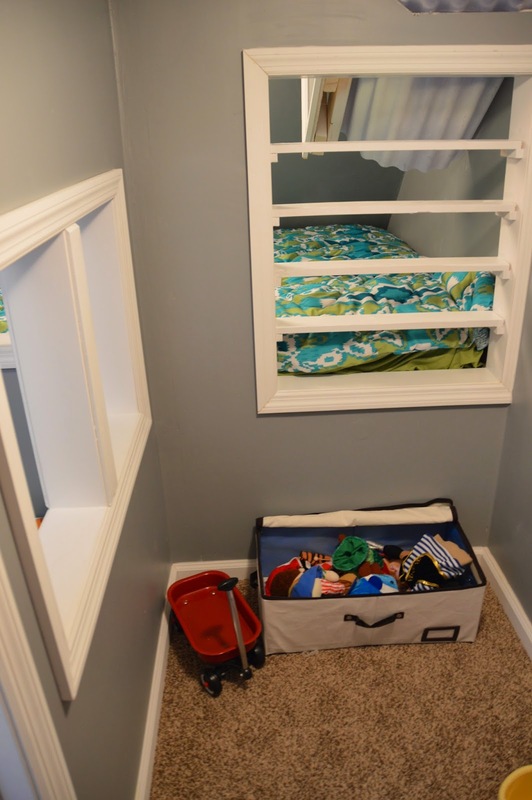 More than likely the KIDS will sleep in the hidden bed while the guests have one of their rooms! Zach also build stairs going up to the attic space (we have a full attic across the entire length of our second story! I’m ALL about some storage!) and build a gate to keep the kids from going up there! 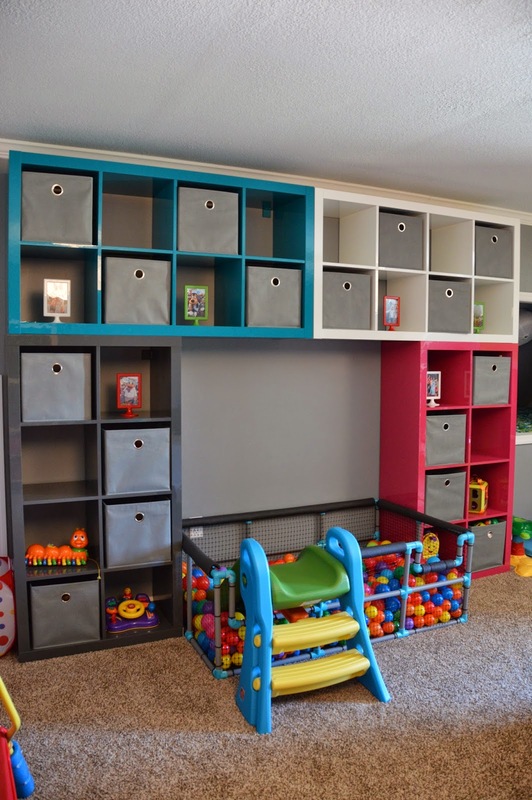 View of one wall of the playroom. 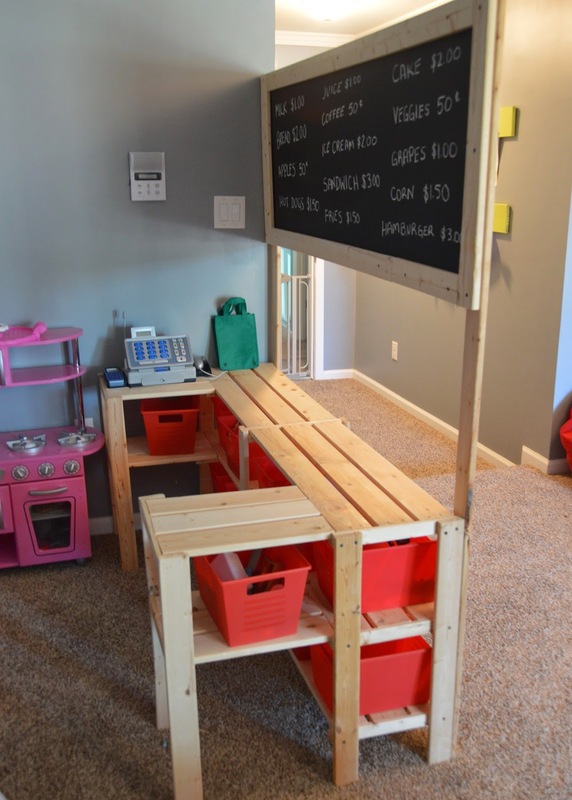 We made a corner area with the grocery store and play kitchen and other play food items. Zach also built our lego table. Again, using Ikea items. He built it as a gift to Kye a few Christmases ago and it’s still standing the test of time! 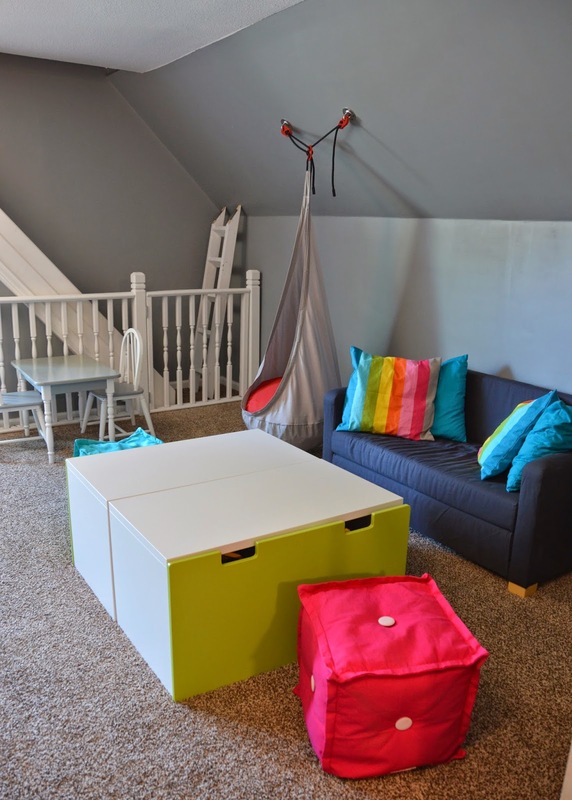 The couch, hanging chairs, and toy boxes all came from Ikea. The couch actually folds out to a bed. Our living room couch does as well. Y’all I mean it when I say we have a TON of sleeping space if anyone ever needs a place to stay! The hanging chairs were a “must have” for us. 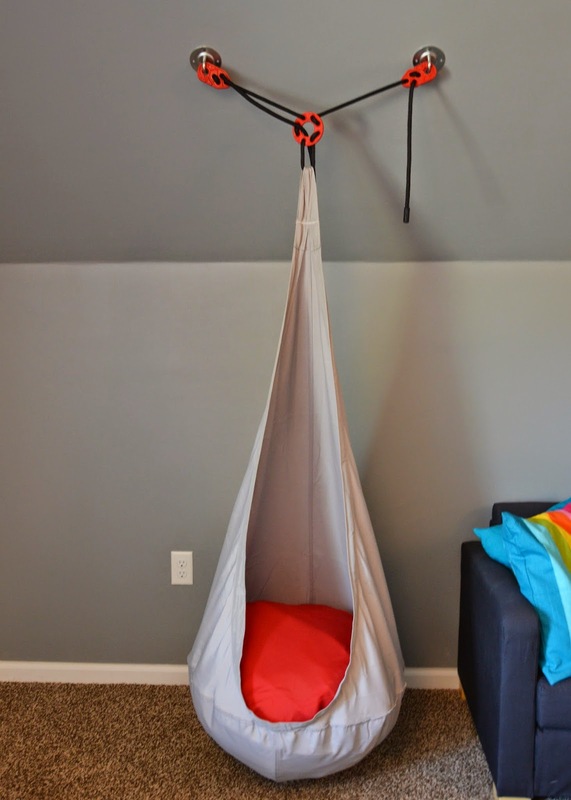 They work like swings and the kids love them! I found the little seat puffs at Target and thought they also coordinated well with the room! 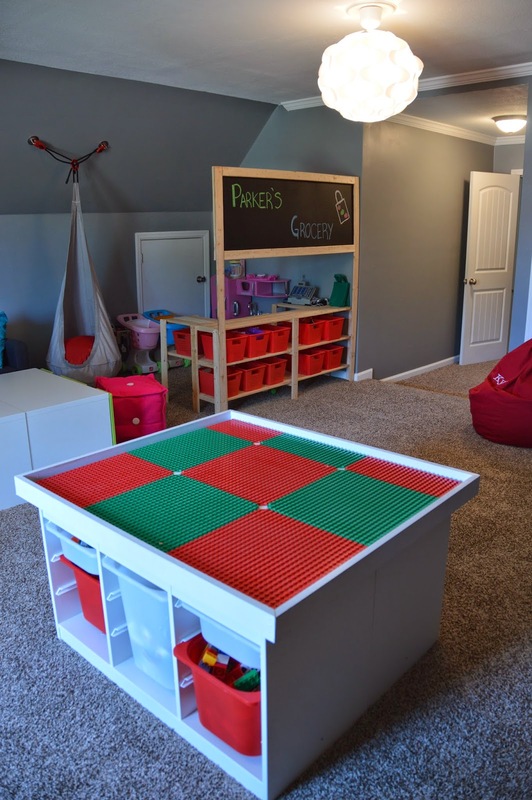 Extra seating in a playroom is always a great thing. When we have people over and their kids go play, we typically have adults up there too supervising so we wanted to make sure to have a comfortable spot to sit! The toy boxes are awesome. They are huge drawers! I love it b/c I don’t have to worry about lids that could smash fingers! The lights are also Ikea. We really would have liked to have done ceiling fans as its the room over the garage so it gets hot. But the ceiling is too low for ceiling fans to work. We are still brainstorming safe ideas to help keep the room cooler. 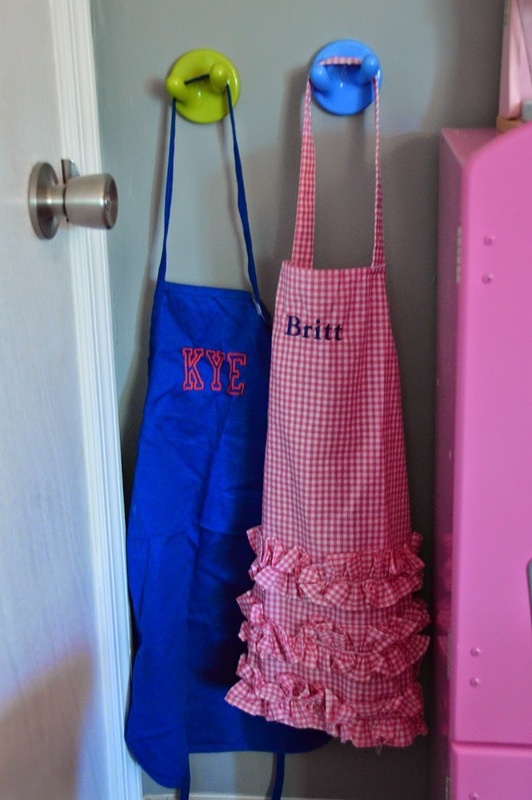 I really wanted a dress up area for the playroom. 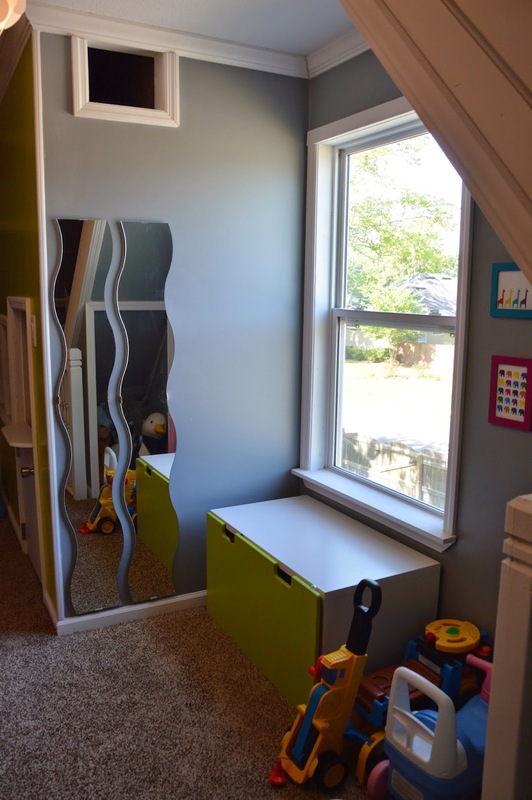 The toy box under the window is filled with play clothes and we hung mirrors on the wall beside it for them to be able to look at themselves. 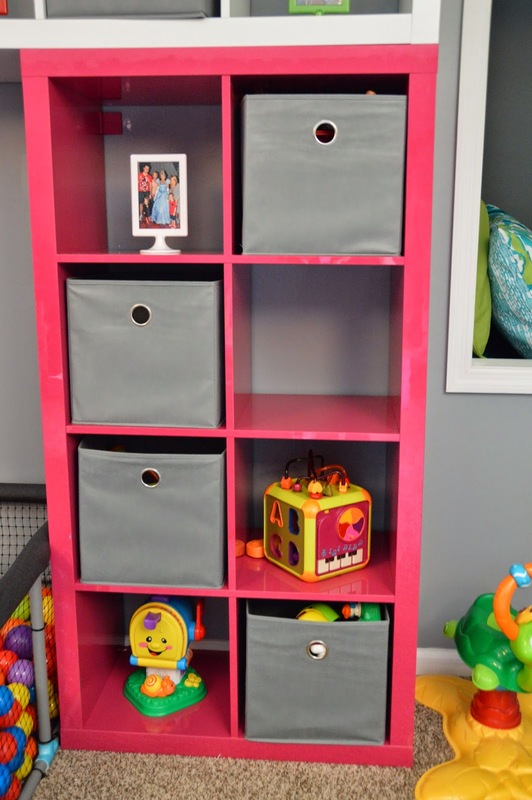 The toy box also serves as a window seat and they love waving hi to Daddy when he gets home from work if we’re in the playroom! Zach actually found this set at our hairdresser’s salon! We got a great deal on it and then he painted the whole thing to match the room. Gate Zach made to keep kids out of the attic area. He also made this ladder. It attaches inside the playhouse to allow the kids access to the second story and the slide. I wanted it to be removable as the kids often play up in the playroom without me there to supervise. It’s SUPER important to me that the entire space is VERY safe. Since I do room time in that room I needed to feel confident that the kids could play and not get hurt. All the toys in the room are for younger aged children and we “baby proofed” it the best we could. Having the ladder removable makes it impossible for the kids to reach the second story of the playhouse so I don’t have to worry about falls! 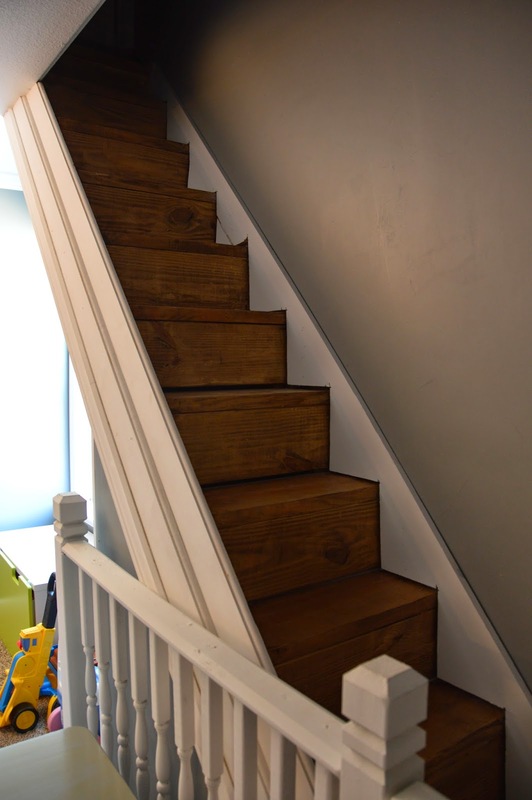 Yes, he even stained the stairs to the attic! 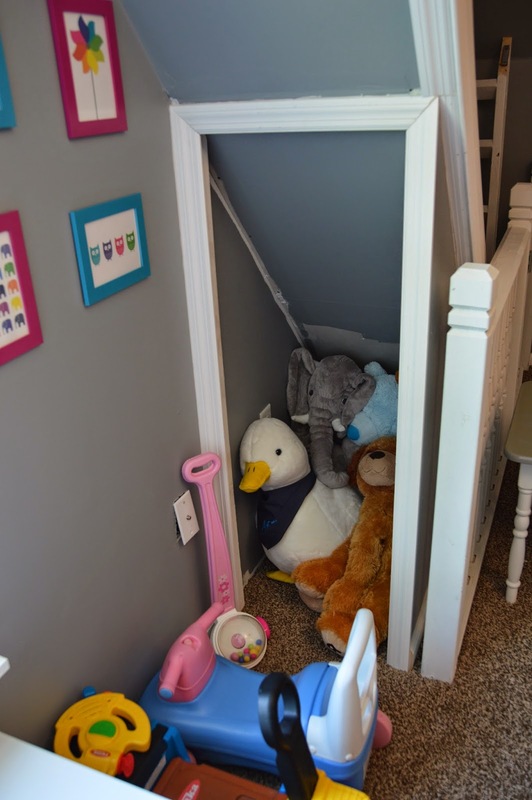 The cubby area under the stairs is a great place to store stuffed animals! 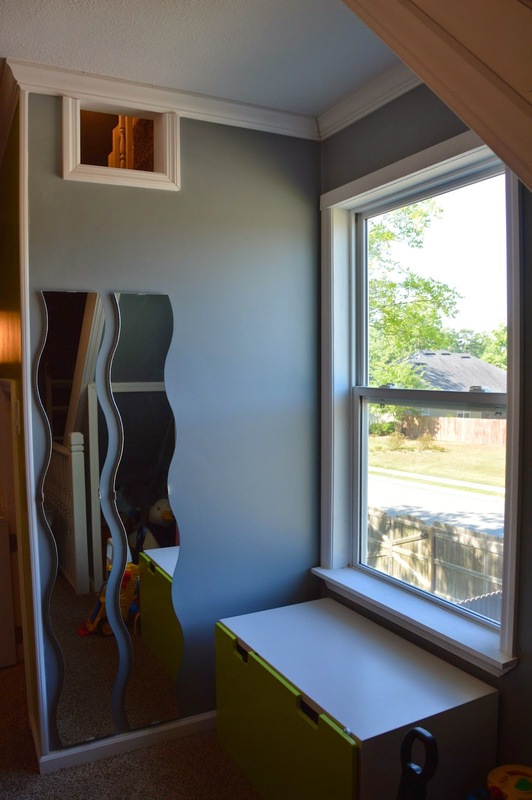 The peek-a-boo window provides extra light to the playhouse and is on the second story where the kids can peak out as they go down the slide! We originally planned to hang a basketball goal on the top of the playhouse. Then we also toyed with the idea of making it look like roofing in that area. For now, it’s just left blank. 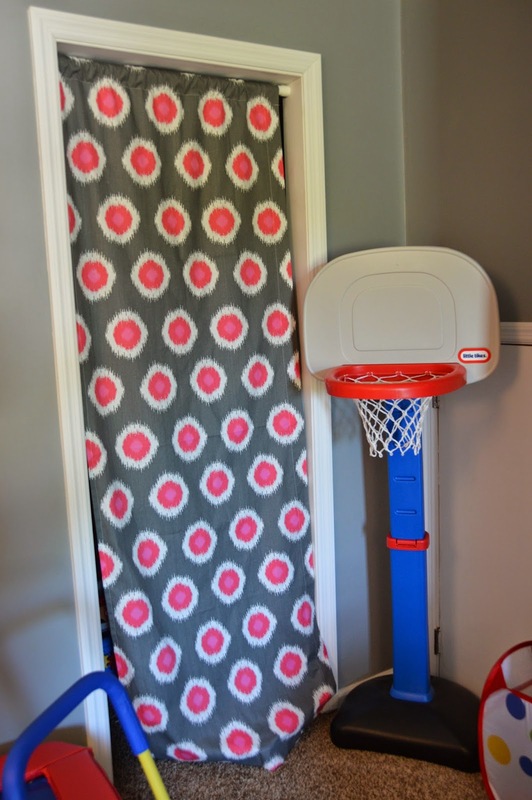 I still like the basketball goal idea but am concerned it will cause lots of paint damage with the ball missing the goal and hitting the wall. So we’ll see! Zach made a half-door for the playhouse entrance. I wanted a place for the kids to put on puppet shows so the low window serves that purpose and we store their puppets inside the playhouse. The hidden bed is beside the playhouse and there is shelving in the playhouse that also leads into the bed area. Puppets and shelves inside the playhouse. You can also see the bottom of the slide and how it feeds into the bed! Perfect place for a SOFT landing!!! 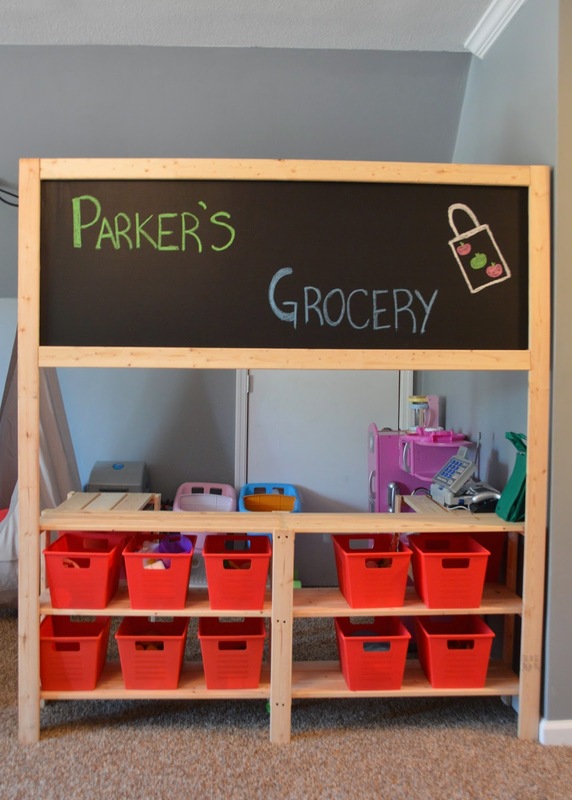 The ladder attaches to this small podium and then the kids can climb from there to the second story. I have never been to the second story of the playhouse but I believe it’s just a little area to be able to get up and then go down the slide! 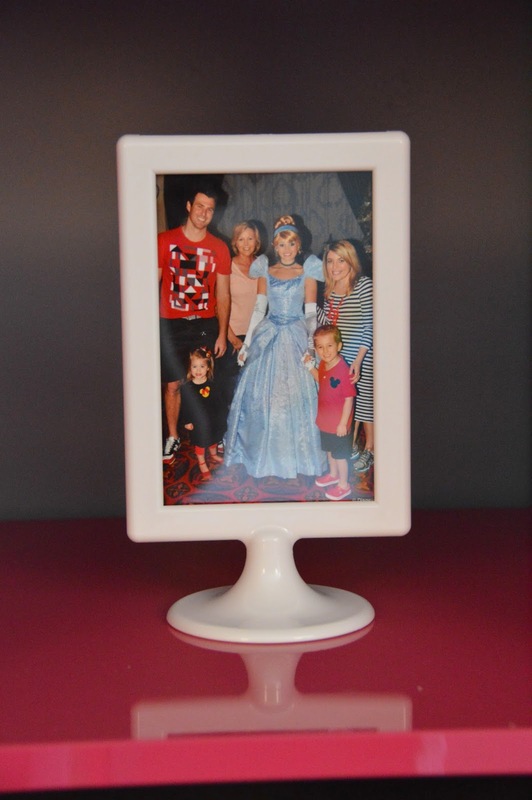 The slide is made from a piece of plastic that Zach molded and curved and it works great! The bed we originally thought was a full size so we bought bedding for it then realized it was a queen size! Oops! I found the bedding at Target and really love it! The kids play in this bed constantly. They love to play “sleep” which is hilarious and usually, all their stuffed animals are all in the bed with them! 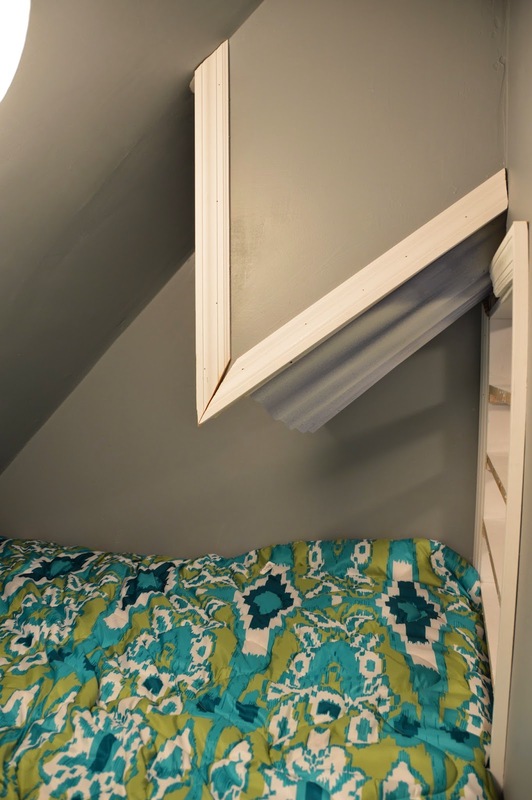 He plans to add steps with storage to access the bed. 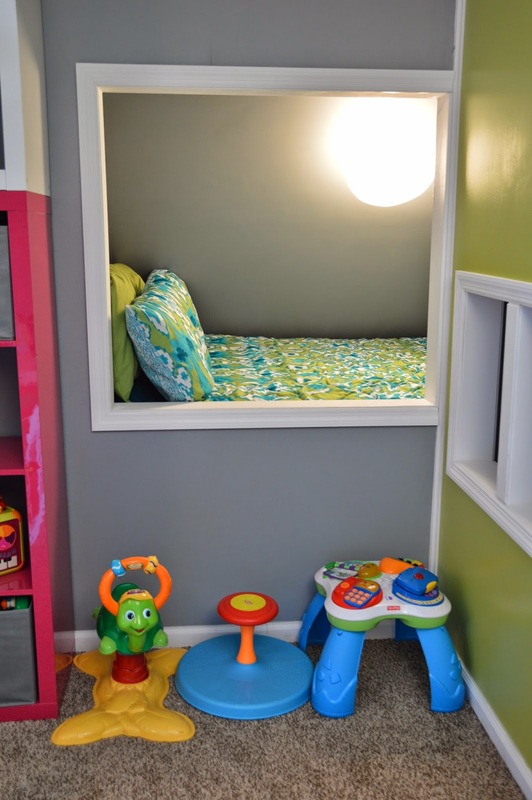 Area in the bed cubby where the slide ends. Storage, as always, was important to me. I try to think long term and I know we will only continue to get more and more toys! Right now the majority of these cubbies are empty! 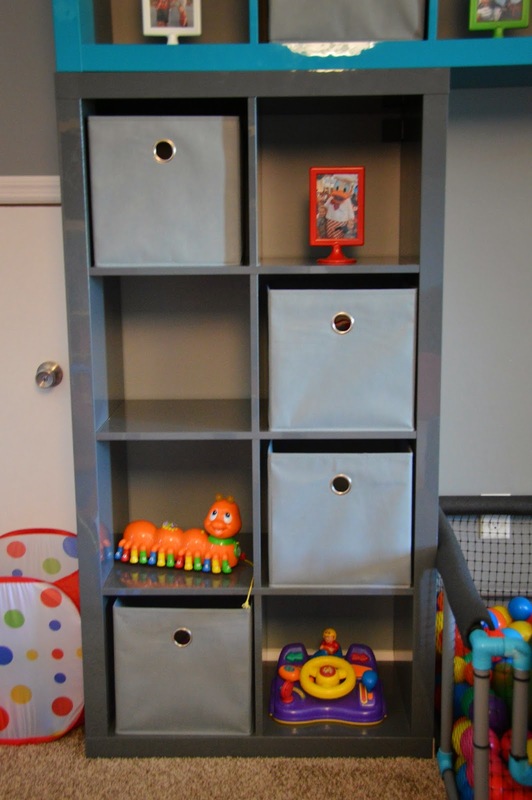 We bought all of the storage pieces from Ikea and I hunted like crazy to find a good deal on the storage tubs. Those things are NOT cheap! Something we had in the other playroom that the kids LOVED was a tent with play balls in it. It was the main thing they enjoyed in the playroom. It was falling apart from so much use! We debated getting a new tent for this new room but instead decided to do the playhouse. It’s way better than a tent, right? Then we also decided to make a ball pit! Zach completely designed it and created it on his own! It’s MASSIVE and he custom cut out an area for the slide we already had to fit in it. Trust me if you have kids they will want to play in the ball pit!!! He made the ball pit out of pvc piping (and spray painted it blue to match the room) then used a black mesh to contain the balls and some “pool noodle” type material to go around the edges. The wall of the playroom backs up to the upstairs bathroom (you can see that room here) so when they build the linen closet of that bathroom they went ahead and built two closet areas in the playroom space too. Right now we just have them as empty space. We have one of those cheap plastic drawer storage things in one of them and the other we just have some larger toys that we didn’t want out. Eventually, we will put shelving in. Or we may use one of the dressers from the current guest room in there since we will not need all that furniture once Britt takes over the room! We’ll see! For now, they are just empty! 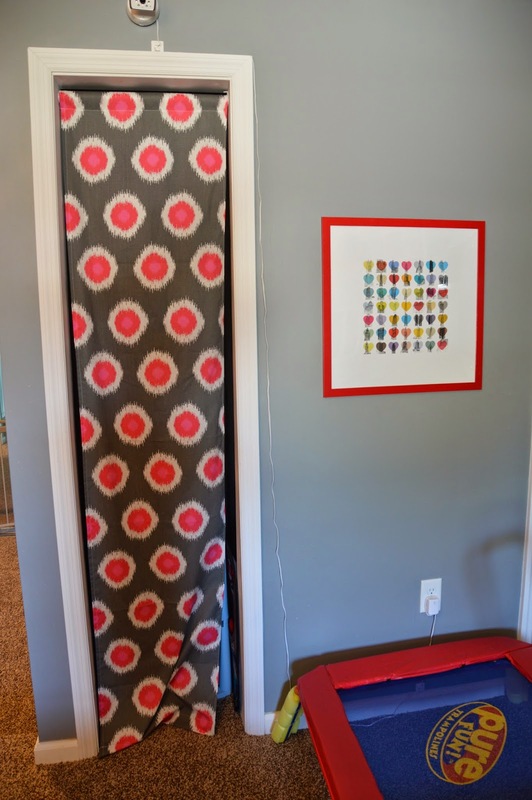 Also to save costs we used fabric for the “closet doors.” Zach’s grandmother made them for us and they are basically “curtains” hung on curtain rods! The fabric is from Hobby Lobby and I think it flowed perfectly with the other colors in the room! 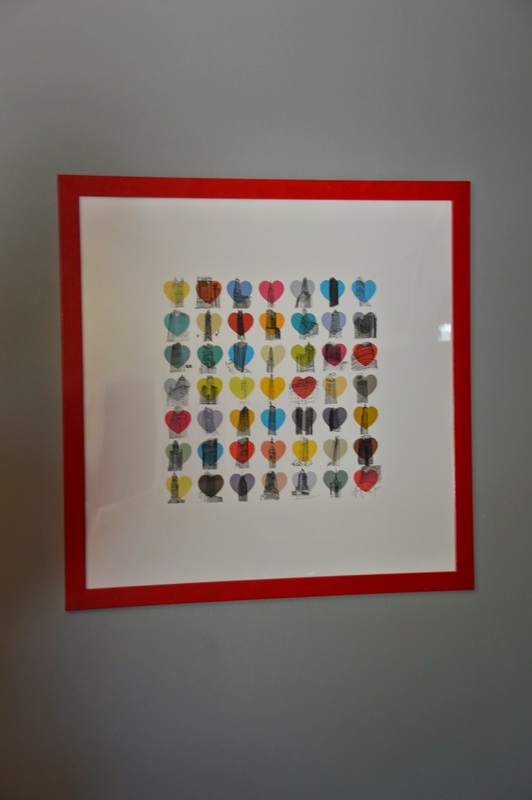 Print and frame from Ikea featuring little hearts with scenes from New York City! I could NOT be happier with the end result! 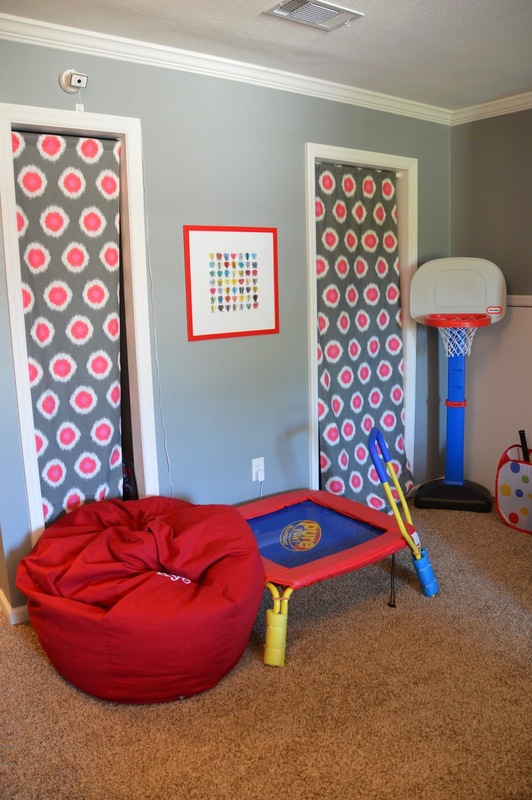 Zach worked long and hard on this room and it was truly a work of love from us both for our children! Zach and I make a great time with stuff like this as I will usually find the ideas and inspirations and he will make them come to life 🙂 He was very, very passionate about this room and took so much pride in his work. It will be so fun to watch our children grow up enjoying this space. For now though I love all the toys and I love hearing the laughter from my children as they enjoy their special room together! This is an amazing playroom!! I am in love with the Lego table. 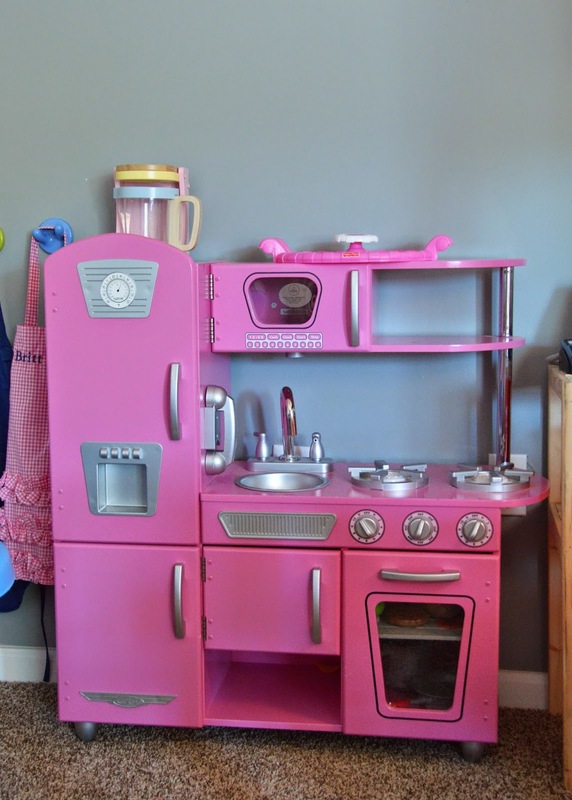 Which IKEA items did your husband use to make that? I have been searching Pinterest for ideas. Super cute room! Thanks for sharing!